‘A few years ago the Fitzwilliam Museum, home to a superb collection of paintings, sculptures and artefacts, became the first collection to sign up to the Public Catalogue Foundation’s Your Paintings project. Today, Cambridge boasts an art collection that pays due testament to its long and illustrious history: since its founding, it has been a cultural and economic centre for Bronze Age farmers, Romans, Vikings, universities and more recently a burgeoning tech industry. Museums such as the Fitzwilliam and Kettle’s Yard are just the beginning. Most of the university’s 31 colleges have collections of paintings and sculptures, managed and shaped by the predilections of a host of curators. Amongst the list of alumnae and honorary fellows are some of the top names in the art world. 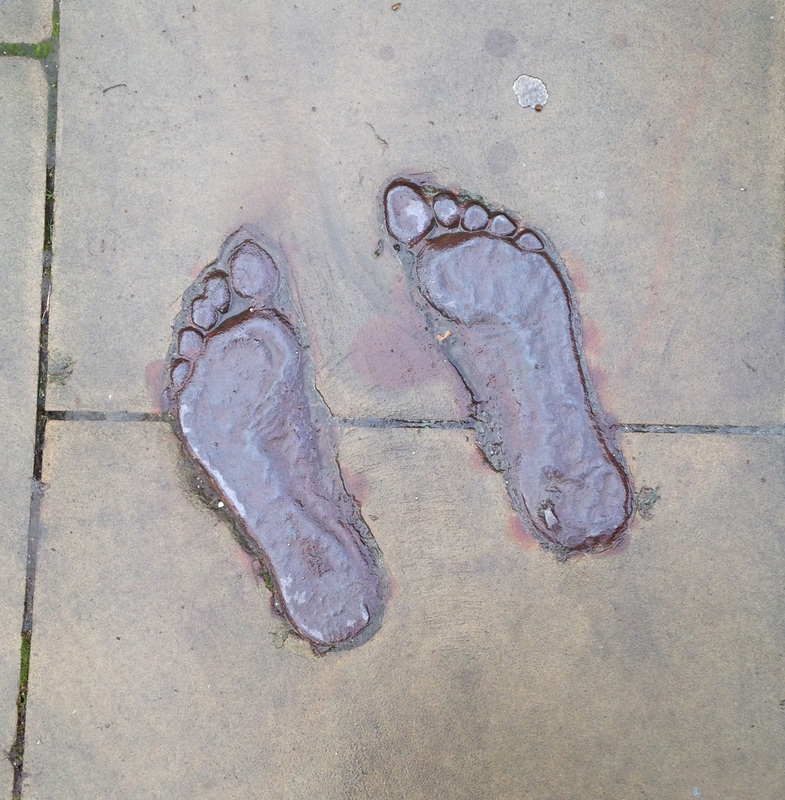 When the laboratories close and the graduates, researchers and fellows have shut down their experiments and joined the throng of humanity exiting the science park under the usual dusting of October rain, one set of footprints is destined not to fade away, nor ever to wander from its spot on an innocuous paving slab near the front gates. Blink and you’ll miss it, but retrace your steps; Antony Gormley’s upside down sculpture, totally immersed in the earth apart from the soles of its feet, isn’t going anywhere. 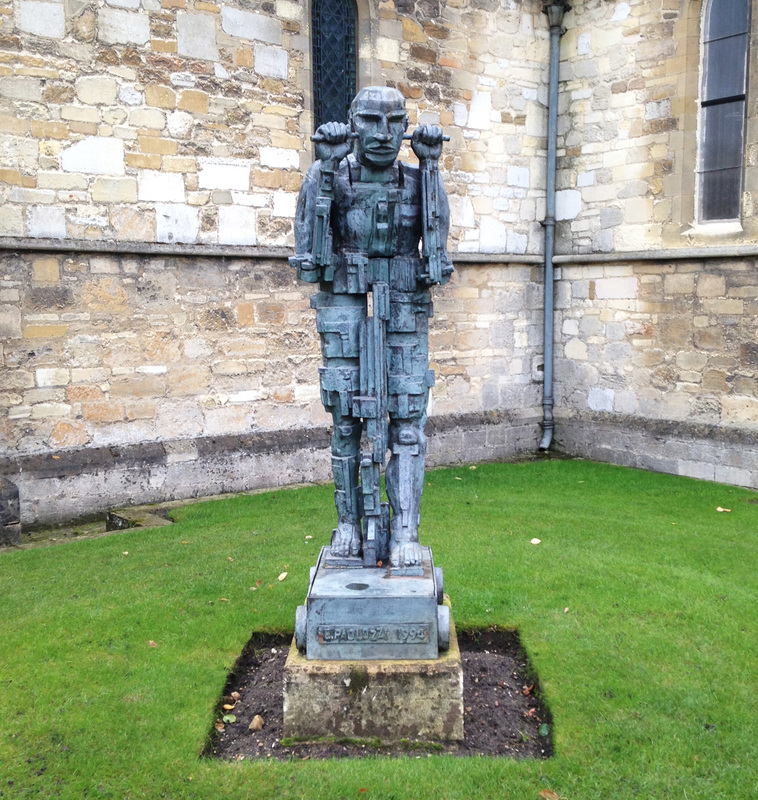 Paolozzi was a sculptor who, more than any other, gave us images of humanity in the age of machines. His subject, Daedalus, was a capricious virtuoso artist who designed a maze so brilliant he trapped himself, who created mechanical wings long before Leonardo and flew to freedom across a sea, who (according to Ovidian myth) ‘put his mind to techniques unexplored before and altered the course of nature’. Paolozzi’s bronze sculpture of the legendary artist is comprised of cogs, girders and fleshy lips and hands. The figure is tortured: part-human, part machine, his limbs and torso enhanced or impaired by mechanical additions. He stands on a wheeled platform, a gesture that at once mocks the subject’s desire to fly, and signifies his making of himself into an art object, worked upon and augmented until it is not clear whether he is man, machine, or art-work. Wu Wei-shan’s Confucius seems to partially emerge from the hewn off hulk of bronze in which he is embedded. His face and robe are idiosyncratic, reminiscent of popular sketches of the Chinese philosopher diplomat executed in the years after his death. His torso is vague, roughly coagulated around two vertical struts of metal. 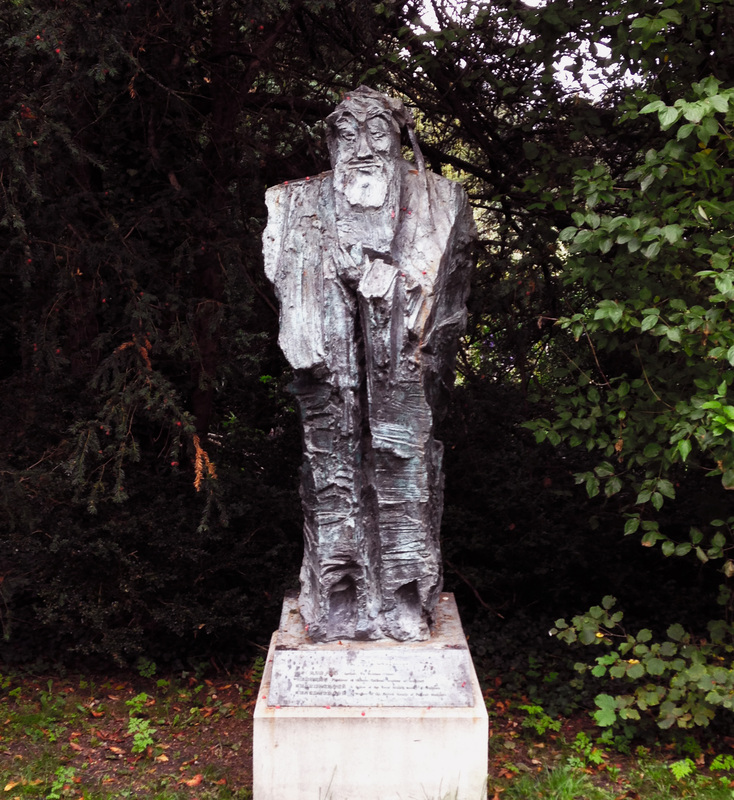 The effect is of an ancient representation that has only been partially recovered; an impression heighted by the sculpture’s site in Clare college, pressed into low-hanging trees and shrubbery by the side of a dirt path so that the figure seems to be emerging from or receding into a pre-modern woodland grotto. 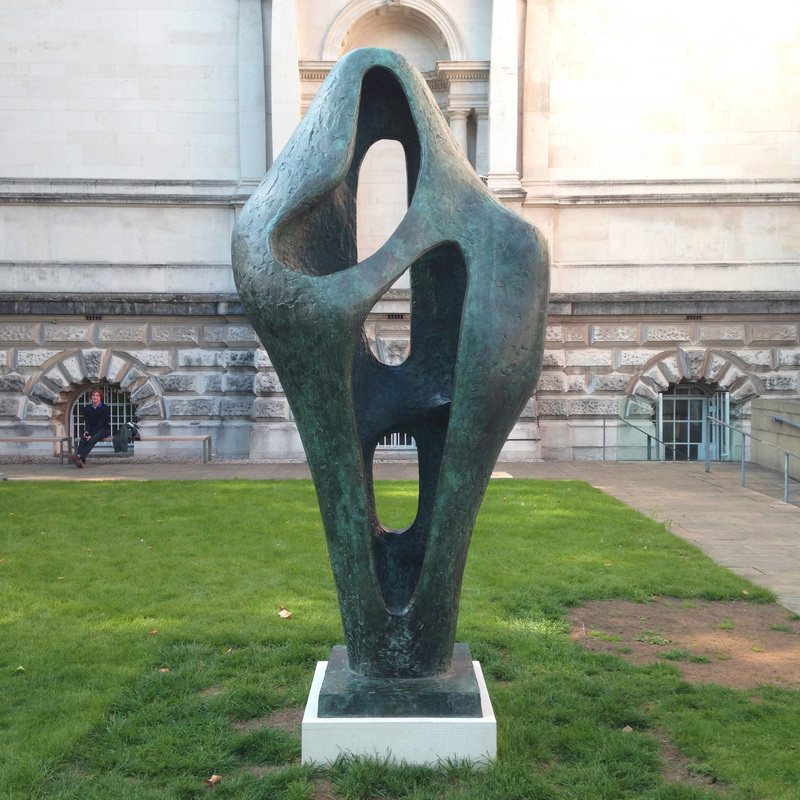 Henry Moore described his sculpture as depicting “the dramatic moment that precedes death”. The subject is caught the second before he hits the ground, but there is little that is heroic about it. The figure is voluminous and liquid; its patina is blue-green and stained with dark lichen so that it looks like the surface of the sea. The sculpture looks as though its fall would end with a splash rather than a crash. Yet this pitiable figure is crowned, halo-like, by its shield. Evelyn Herring’s Mortal Man is sited beneath the canopy of a venerable tree whose leafy, autumn-stained limbs scrape the ground in a wide circle around its trunk, forming a private, high ceilinged space invisible from the nearby path through Jesus College. 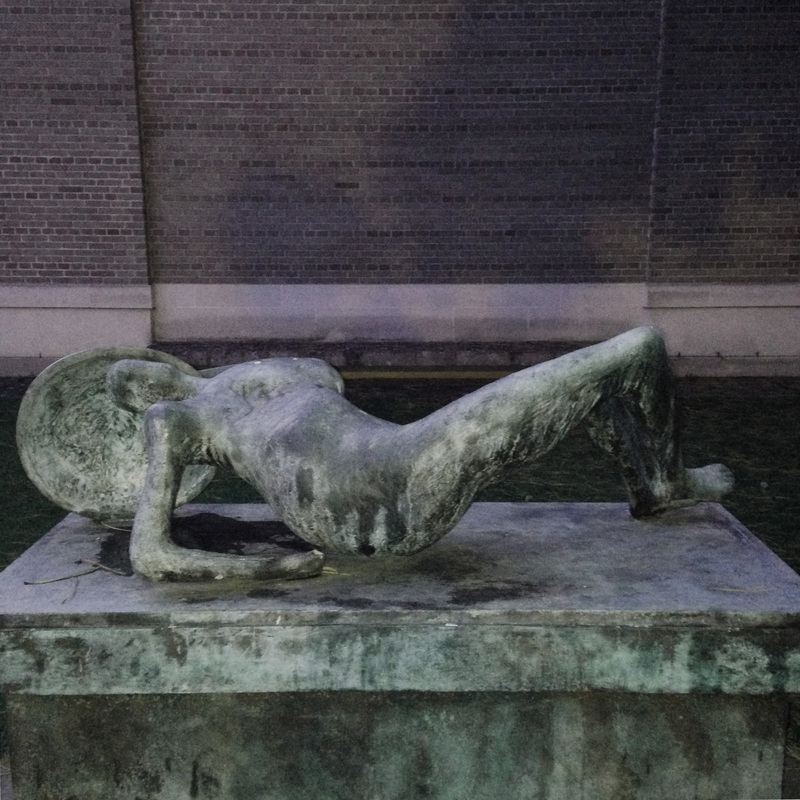 The bronze figure is hunched and inward focused: it turns its back on its situation and on spectators. 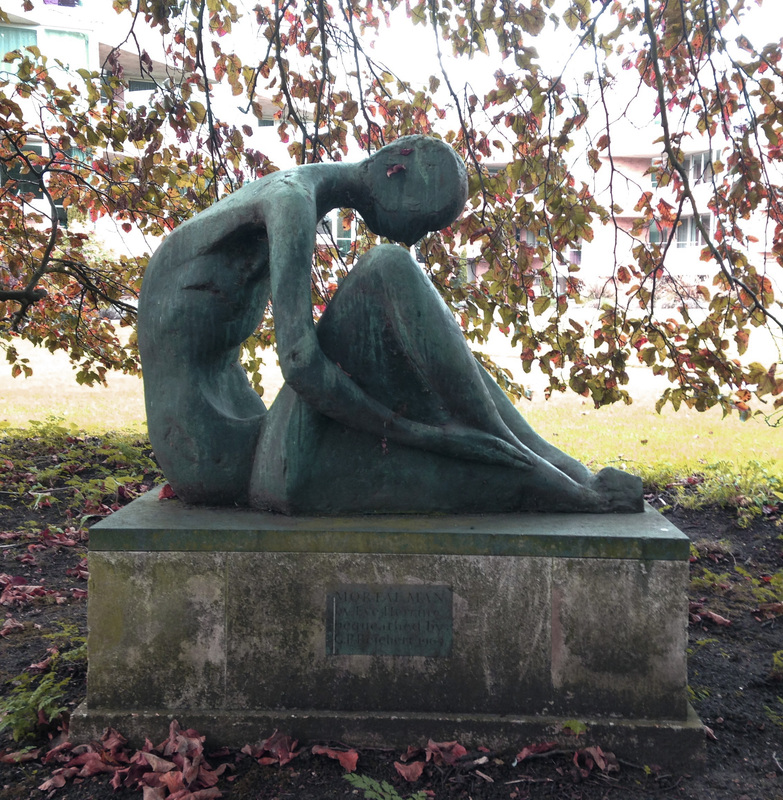 The sculpture is intensely melancholy; its setting in the intimate but natural space beneath a tree feels necessary. 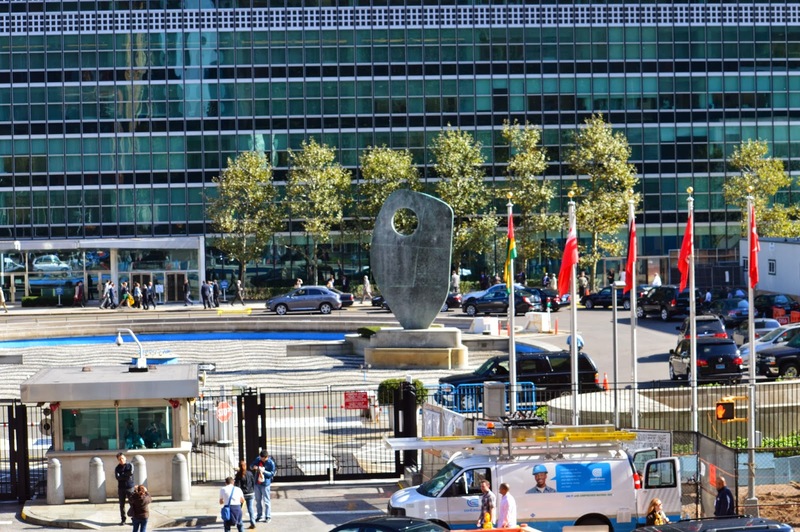 We are happy to have been contacted by a few professional sculptors who are enthusiastic about the Your Sculpture project and have been following progress of the development phase via this blog. Two of those sculptors, Diane Gorvin and Phil Bews, work together to make sculpture for the public realm. 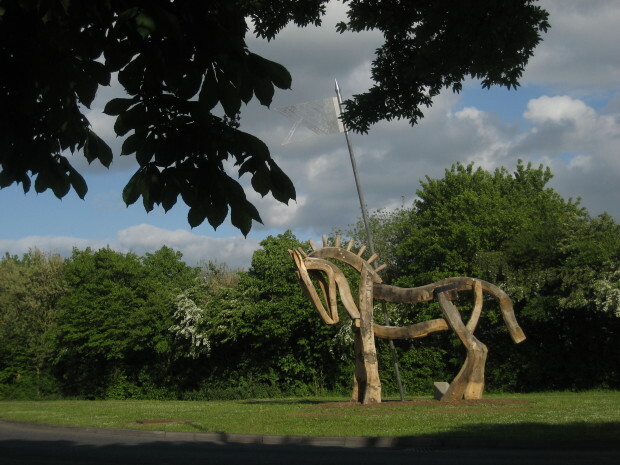 Based in the Forest of Dean, their sculptures can be seen in many locations across the UK, including Belfast, Bristol, London and Cardiff, as well as overseas. They have made a film about the making of one of their recent works, The Arrivall’, which is in the running for a CODAvideo Award for the People’s Vote for the best video about commissioned art. 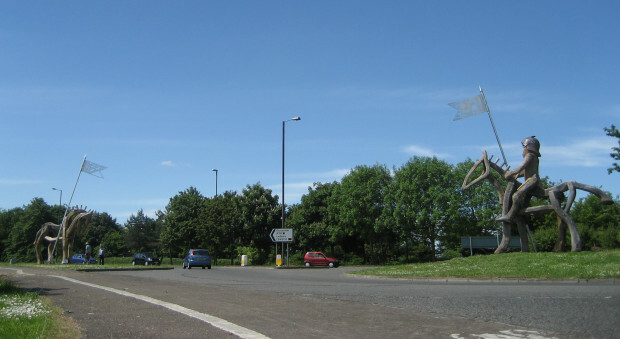 Commissioned by Tewkesbury Battlefield Society, The Arrivall, is sited on Stonehills Roundabout, Tewkesbury, and marks the site of the battle in 1471 during the Wars of the Roses between the Yorkists and Lancastrians. The title, ‘Arrivall’, is taken from the 1471 account of the recovery of Henry VI’s English throne by Edward IV. The work consists of two horses; one with a rider to represent the victorious Yorkists and the other a vanquished Lancastrian horse. Both sculptures are constructed from English Oak. The horses are 5m tall; 5.5m to the top of the knight. The pennants are made from aluminium alloy and are on 8m high poles. The pennants are designed to rotate in the wind. The film about The Arrivall can be viewed here. 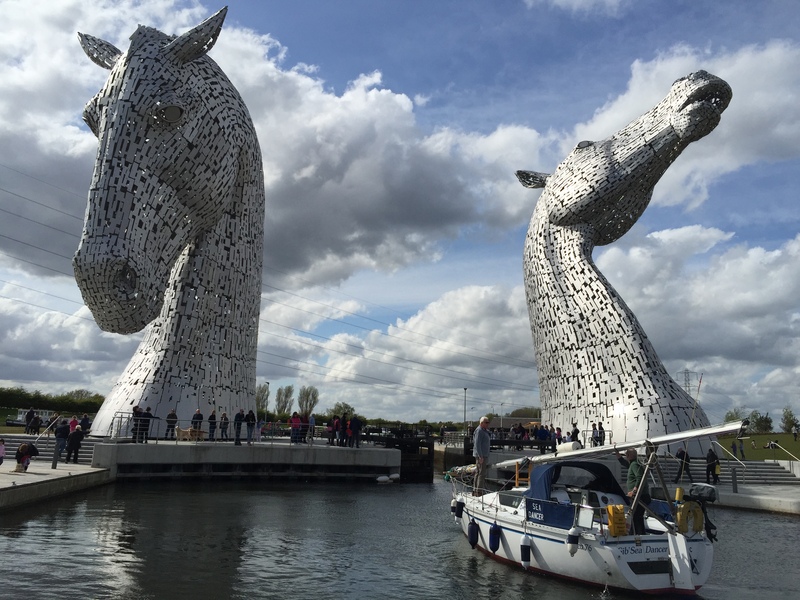 Another film in the competition shows how The Kelpies in Falkirk (below) were made. To view all of the films in the competition and vote for your favourite, visit the CODAvideo website. The films about The Arrivall and The Kelpies are about half way down. Voting closes on 29 October. Images of The Arrivall by Diane Gorvin and Philip Bews. Image of The Kelpies by Anthony McIntosh. Part of the Delivery Phase of the Your Sculpture project (funding permitting of course) will see our project partners, Culture Street, make films about sculpture with young people and for young people. The films will be made across the UK, with local schools, and will focus on sculpture in collections and out in the public realm. To test out how it will all work and the processes involved, Culture Street is making two films during the project Development Phase. Footage for the first one was captured this week. 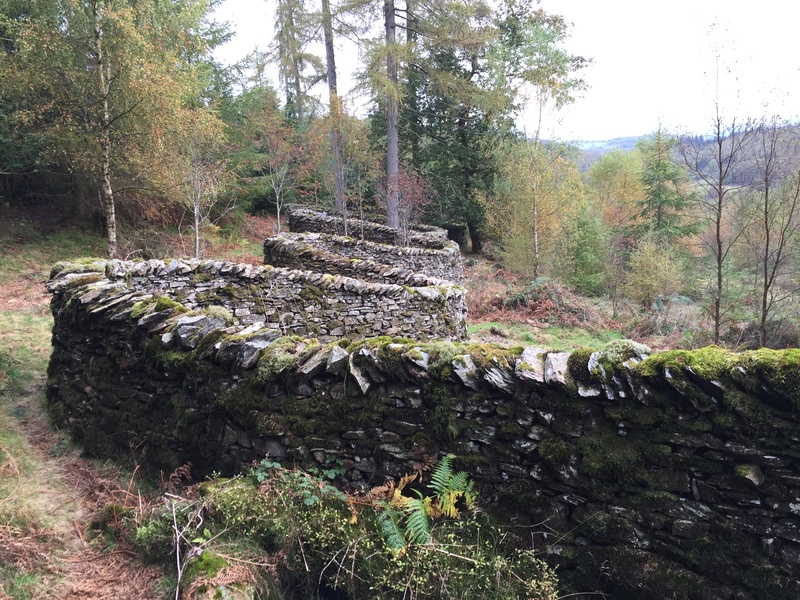 This film focusses on Andy Goldsworthy’s ‘Taking a wall for a walk’ in Grizedale Forest in the Lake District. 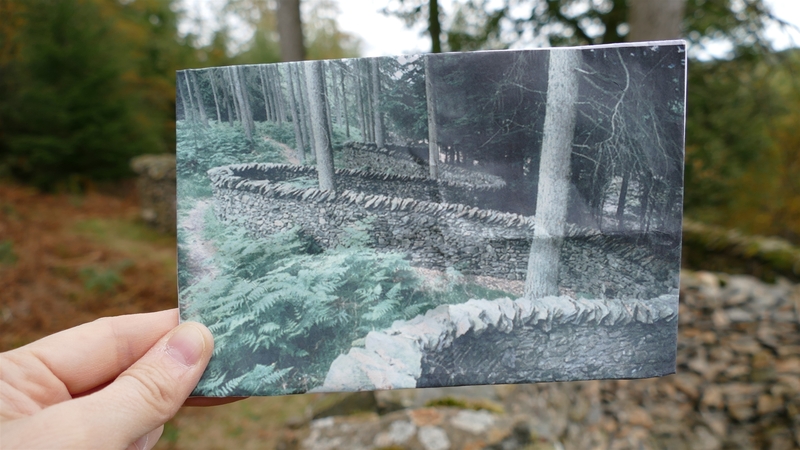 Installed in 1990, the sculpture is a drystone wall that weaves around trees, although some of the trees have since fallen down or been felled. Sheryl from Culture Street had found an image of how the work looked in 1990, with all the trees still in situ: Culture Street started the process by working in the classroom with a group of around 20 Year 9 pupils (aged 13-14 years) at their school, Dowdales, Dalton-in-Furness, Cumbria. The group looked at pictures of sculptures and were asked how they thought they were made. Their answers and opinions were recorded to get them used to the cameras and microphones. 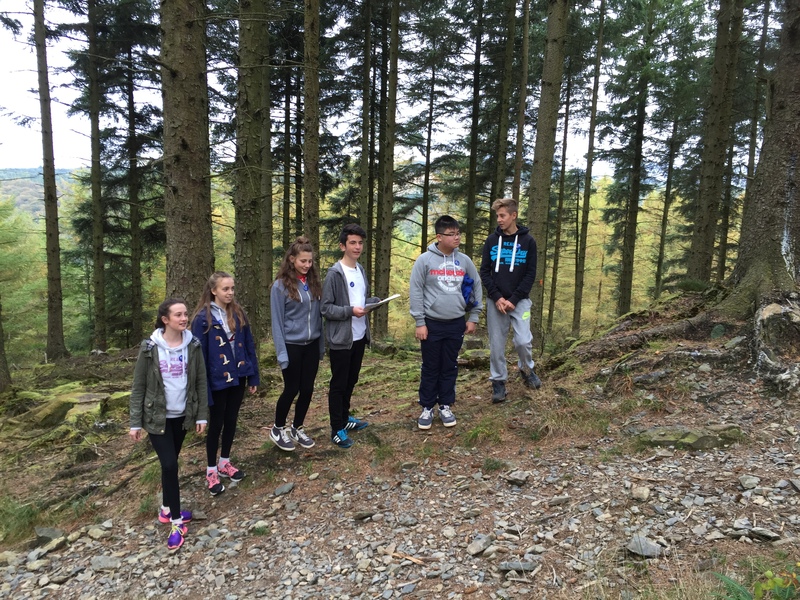 A smaller filming group of 6 students was then selected after that session to go to Grizedale Forest to create the film. We gathered at Bogle Crag car park first thing on a Monday morning before setting off into the forest to make the film – two staff from Culture Street (Keith and Sheryl), two teachers, six students and me. Having secured a key from the Forestry Commission to get through the barrier and drive up a track through the trees, we had a 20-minute walk up a stony track to get to Andy Goldsworthy’s sculpture. 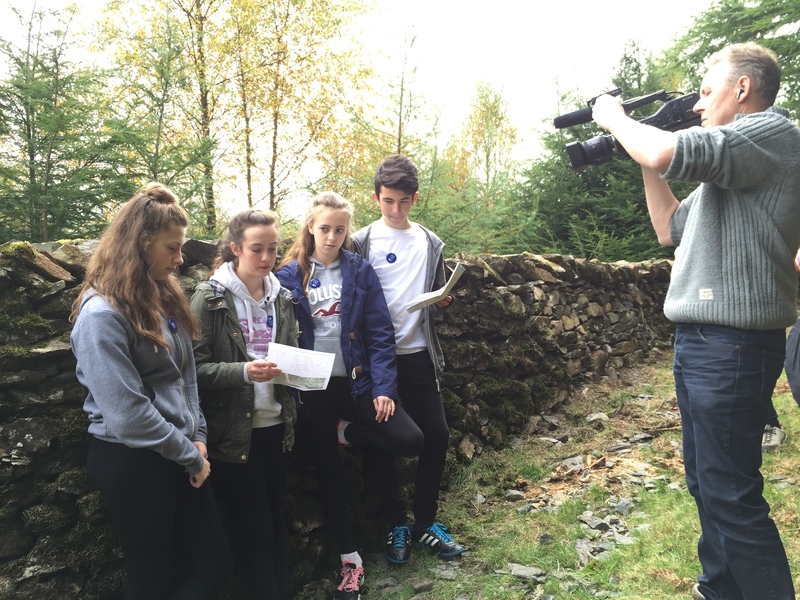 Some filming was done on the way: When we got there, the students walked past the work at first, thinking it was just another drystone wall, until they told to stop and look back down the hill. It was then that they saw the wavy shapes the stone wall makes across the landscape and around the trees. The film aims to reflect the students’ views and questions about public sculpture in general and this work in particular. Their discussions considered what sculpture is, how public sculpture ages and changes over time, what might have inspired Andy Goldsworthy to create the work, how it was made and who actually made it. They had some interesting view points and not all them thought that this was art! 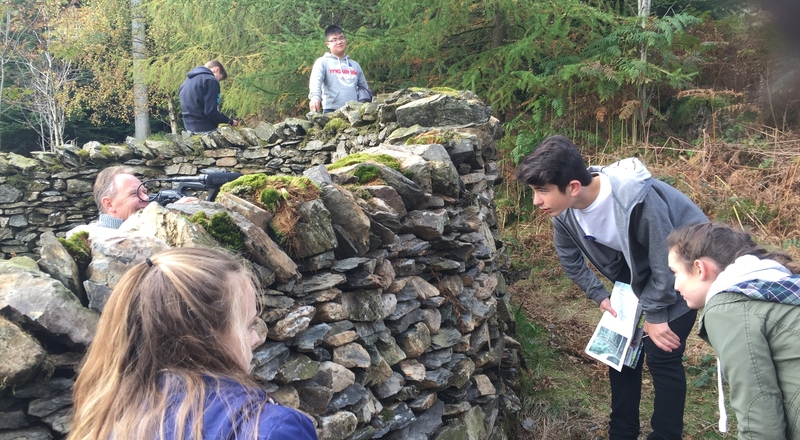 The making of the film really got the students thinking about sculpture, and the teachers felt it gave the young people ‘a deeper understanding of what makes sculpture and art’, as well as developing ‘independent thinking skills’. It also helped them understand how films are made. Finding out how many hours of footage needs to be gathered to create a film that is just a few minutes long came as a bit of a surprise to most of the group. Keith experimented with some interesting ways to film the students, using the wall to find new camera angles: After just over an hour and a half’s filming, we were all ready for lunch, so we made our way back down the hill for some well-deserved food and a hot drink. The footage will now be edited into a short 3-4 minute film. Another pilot film, made with another school and looking at sculpture in a museum or gallery collection, will be made shortly. 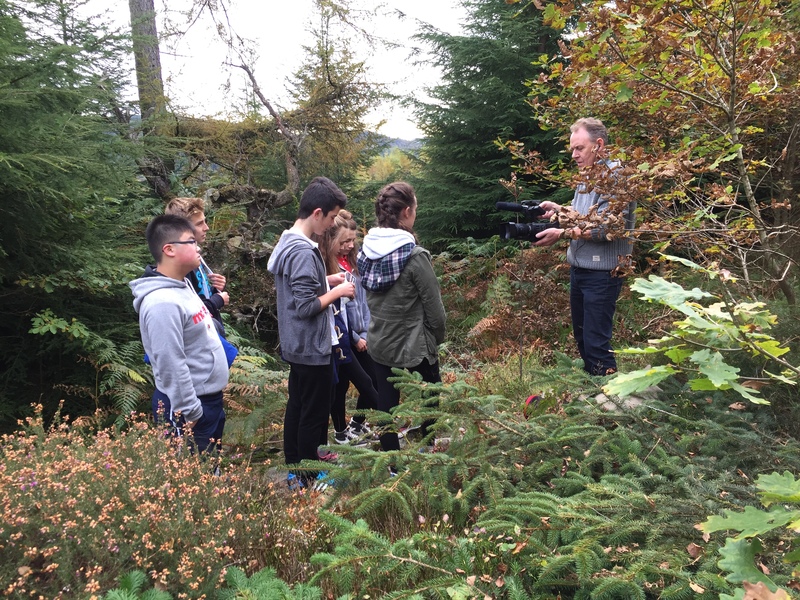 Thanks to the teachers and students of Dowdales School for their involvement and taking time out to help make the film. Thanks to Keith and Sheryl of Culture Street for all their hard work and enthusiasm. We are looking forward to seeing the completed film. Barbara Hepworth moved to St. Ives in 1939 in order to escape a panicked London shortly before the declaration of the Second World War. Although her arrival was not auspicious, Hepworth admired the ‘barbaric and magical countryside’ of Cornwall, studded with ancient standing stones and hemmed by dramatic coastal landscapes. Thirty years later, and towards the end of her life, Hepworth declared the area her ‘spiritual home’. My grandmother started Art College in the early sixties, a time when Hepworth had established her predominance over the British sculpture scene and her predilection for the monumental was exerting a hypnotic influence on aspiring sculptors. On my grandmother’s first day her tutor asked her to choose between pursuing a vocation in painting or sculpture. Without hesitation, my grandmother chose painting. Her reasoning was that, as abstraction and monumentalism were dominating sculptural creation, she did not want to work in a medium that would require her to depend on male students to carry up gigantic, heavy blocks of stone for her from the Central Saint Martin’s basement! 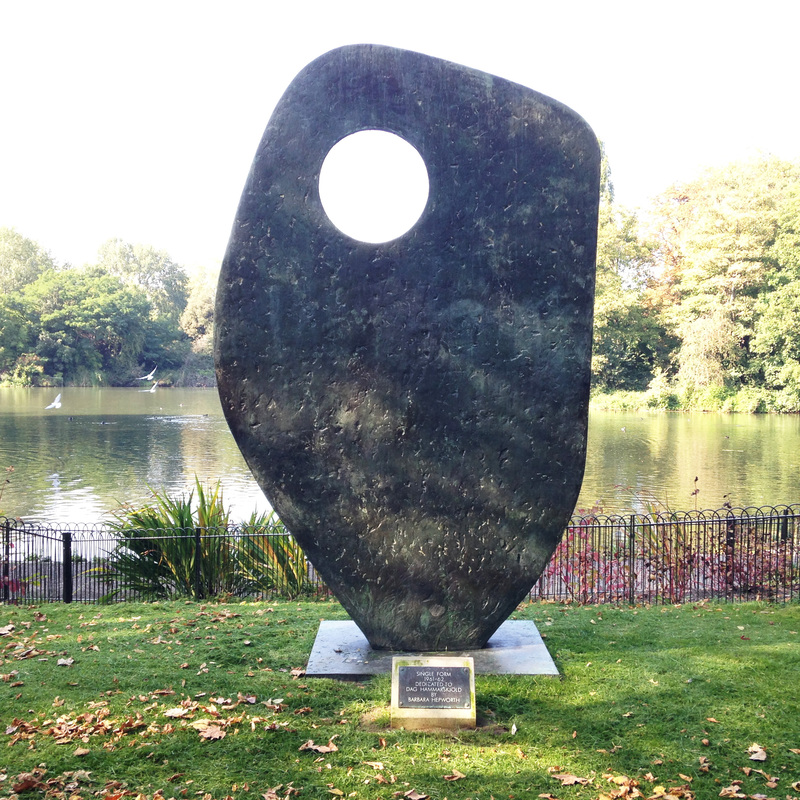 Hepworth’s massive Single Form, in Battersea Park, made me think of my grandmother. At over ten feet tall, Single Form occupies the outer limits of what can be accomplished in a single bronze casting. When interviewed in 1972, in the last few years of her career, Hepworth stated that she thought ‘every sculpture must be touched. It is part of the way you make it and it’s our first sensibility: the sense of feeling; the first one we have when we are born.’ The current exhibition of Hepworth’s work at the Tate Britain suffers the major flaw of having locked Hepworth’s sculptures away in irritatingly reflective glass cases, and for having instructed its stewards to keep an eagle eye on fingers twitching to caress Hepworth’s tactile bronzes. Fortunately, on the front lawns of the Tate Britain, is Figure in Landscape, which is happily exposed for the general public to peer at, prod and stroke it to their heart’s content. John Lewis opened its flagship store on Oxford Street in 1961. 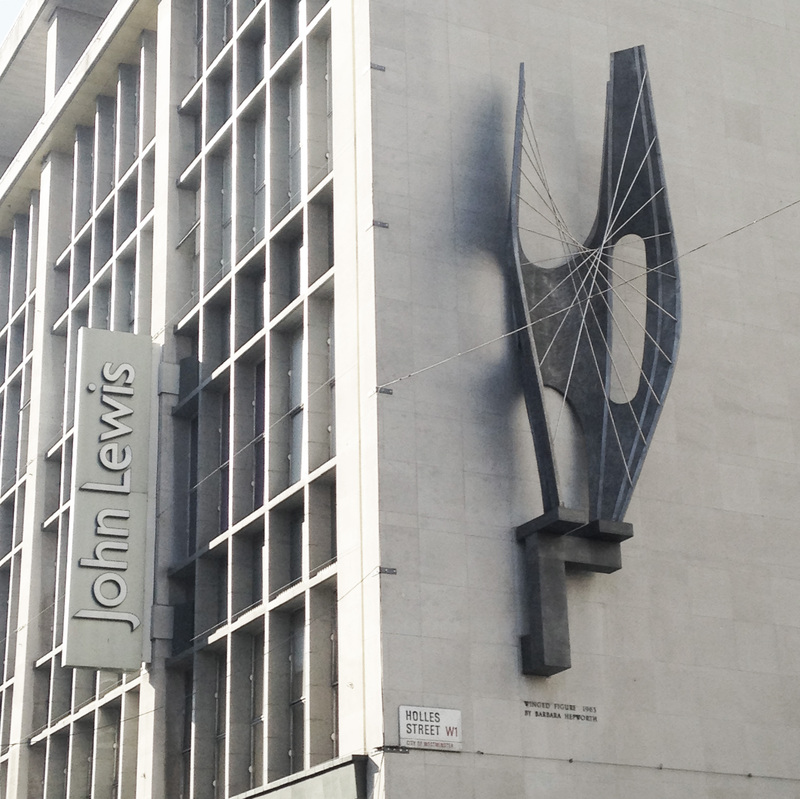 To celebrate the occasion, and to project a marketable image of urbanity, John Lewis commissioned a sculpture to adorn the plain façade that faces onto Holles Street. 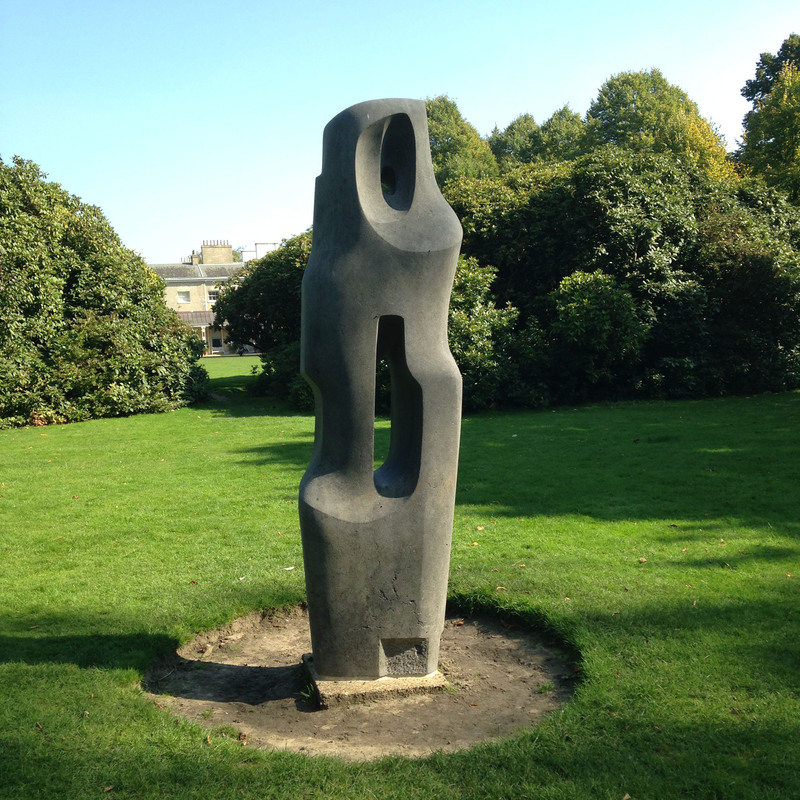 Several sculptors entered the competition, including Barbara Hepworth. All of them were rejected. On her second attempt, Hepworth’s sculpture, Winged Figure was accepted. In 1963 the sculpture was fixed in place. Barbara Hepworth declared that she thought ‘one of our universal dreams is to move in air and water without the resistance of our human legs. If the Winged Figure in Oxford Street gives people a sense of being airborne in rain and sunlight and nightlight I will be very happy.’ The current gleam of the aluminium and stainless steel sculpture is due to a recent restoration.